Oakland is an unincorporated community in Oakland Township, Franklin County, Iowa, United States. Oakland is located along county highways C70 and S21 1.2 miles (1.9 km) southwest of Popejoy. ^ a b "Oakland". Geographic Names Information System. United States Geological Survey. ^ "Franklin County, Iowa Highway and Transportation Map" (PDF). Iowa Department of Transportation. January 1, 2017. Retrieved April 15, 2018. 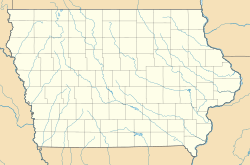 This article about the geography of Franklin County, Iowa is a stub. You can help Wikipedia by expanding it. This page was last edited on 15 April 2018, at 18:53 (UTC).